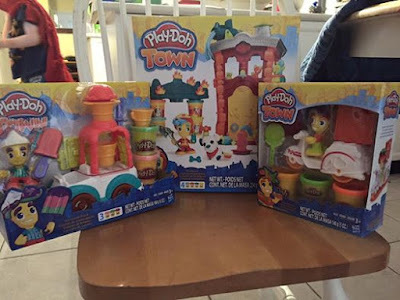 Tales of Mommyhood: Playtime Fun With Play-Doh Town! Playtime Fun With Play-Doh Town! Most kids love to play with Play-Doh. Between the feel of it squishing between your hands, and the endless creativity that can go along with Play-Doh - it can definitely provide hours of fun. Now, they can have fun with Play-Doh Town! They can build their little town with the buildings and other accessories that are available, all while having fun with Play-Doh! There are many sets available - Firehouse Playset, Fire Truck Playset, Ice Cream Truck Playset, Hairdresser and bird figure, Roadworker and Pup figure, Pet Store Playset, Pizza Delivery Playset and Police Officer and Vehicle. They range in price from $14.99-$29.99. These are great price points for birthday gifts! We were sent 3 of the sets to see for ourselves and with 2 snow days in a row last week, it was the perfect time to get them out for some fun! The recommended age is 3+, and I would say it's good until age 5 or 6. I'm sure my younger grandchildren would have a ton of fun with this Play Doh town. My girl loves all things Play doh......these sets would be a great addition to our collection!